Originally I found a recipe for "Cajun Black Bean Soup" somewhere on the internet with credit given to the Bush's Beans company as the original source. Since I was going for a Cajun theme for dinner and I love black beans, I decided to try it. As I was blogging it today I decided to link to the original recipe where, it turns out, isn't Cajun at all. LOL! 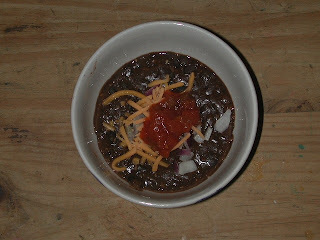 It's called Bush's Best Black Bean Soup. Oh well. It's still easy to prepare and full of healthy fiber and it tastes great. Heat oil in large pot over medium heat. Add onion, cook 5 minutes. Stir in garlic, cumin, chili powder and oregano. Puree one can of black beans, add to pot. Add second can of black beans (do not puree). Drain last can of black beans and add to pot (do not puree). Reduce heat and simmer for 15 minutes, stirring often. Add black pepper, to taste. Top with salsa, shredded cheese and fresh herb.